What's in these Petite Travellers' bags? Have you ever wondered what other mums pack into their kids' travelling bags? Here's a peek into the kiddie bags of four of our most loved mummy bloggers...First up, let's check out the bags belonging to Zee from A Nugget of Joy! Mommy's Helper inflatable bath tub - Since #2 still can't stand up for his baths, I was looking around for a travel tub and thought this was perfect since it is compact enough to be packed away once deflated, and is the right size for him. Guess what, he really looks forward to his baths in the inflatable tub! Mothers En Vogue nursing shawl - I bought this when I was still nursing and even though I've just stopped nursing, I've gotten used to bringing this around since it doubles up as a shawl for me and a blanket for the kids if they fall asleep in the stroller. I love how soft it feels to the skin and how I can easily fold it and keep it in the diaper bag. Badger Aromatic Chest Rub - This was introduced to me by a friend and the kids and I love it. Aly especially, requests for this to be applied on her chest and under her nose and when she has a cough or when she has a blocked nose. It comforts her and helps her to sleep better. California Baby calendula cream - This multi-purpose cream can be used by the entire family and is my solution to any skin problems when we are traveling. It also doubles up as a diaper rash cream and helps to sooth and moisturize dry skin, especially in cold weather. Plum organics super puffs - No packing is complete without snacks for the kiddos. I usually bring along with me a variety of baby snacks. These are especially useful during mealtimes, on the plane when they are bored and fussing, and generally for whenever we need some peace and quiet! Munchkin diaper clutch - This is one of the most useful items during my travel as it has pockets for diapers, wet wipes and plastic bags and opens up to be a diaper changing pad (with everything I need within easy reach). This means that I only have to bring this diaper clutch along (and not the entire diaper bag) when I have to change for #2, which is really useful on the plane where changing has to be done in the tiny toilet. Babyganics alcohol free hand sanitizer - perfect for the times I need to handle milk bottles or feed baby, but have no access to a sink or a toilet. Peter Rabbit organic pasta sauce - With this, preparing a meal of paste for the kids is a breeze! Especially useful on days when the kids have nothing suitable to eat when traveling. Pigeon hand and mouth anti-bacterial wipes - I use this to wipe the kiddos' hands before every meal and to clean their mouths and hands after meals! Hello Kitty kids cutlery and Oxo spoon in travel case - These are important since not every restaurant/eating place we visit offers kids cutlery. If I want #1 to self feed, then I have to give her suitable cutlery to do so. It is even more important for me to bring our own spoon for #2 since spoons provided by the restaurants will probably be too big for him. The travel case for the Oxo spoon is useful for times when we have no time/opportunity to wash the spoon after feeding #2. The next submission comes from Debs G from Owls Well and Owl Fly Away travel blog. Check out her detailed itineraries for Down Under, Hakone, and Pembrokeshire! Doodle pad from The Paper Stone - I like this spiral bound notebook with blank pages - really great for keeping the kids occupied on long journeys and in restaurants. They can draw, colour, write notes and play tic-tac-toe. Ballpoint crown pen from The Paper Stone - This is a nice, very slim pen that writes well and looks pretty. The bright colour makes it easy for me to find in the dark depths of my bag! Hello Kitty box from Daiso - I use this to store emergency supplies like bandaids, hair elastics and safety pins - you never know what can go wrong on your trip. It's really tiny, so it tucks away nicely in the inner pocket of my purse. Patterned bandaids from Watsons: There's nothing that cures a scraped knee better than a kiss and a colourful bandaid! I like the Hello Kitty patterns for Little E and the Spiderman patterns for J. Kid's sunnies from Polaroid: These are uber-flexible sunglasses with large wraparound lenses that are great for kids. They come along with us on every holiday - especially beach holidays! Identity bracelet from My Safety ID - These wrist or ankle bands contain vital information like emergency contact numbers and allergy warnings. I carry one for each of my kids and if we're going to a really busy and crowded place where there is a risk that we might get separated (like in an airport or at a theme park), then I have them on hand for the kids to wear! Lip Sugar in Berry from Fresh - I love this tinted lip treatment with SPF 15 which feels very silky when it goes on and looks great. It is especially good for preventing lips from getting chapped in dry or windy weather! Hero4 camera from GoPro - This is my latest toy and I love it because it is SO tiny. It takes great videos, decent photos, and it's waterproof and super hardy! I haven't used it much yet, but I can already tell that it's going to be a permanent resident of my handbag! 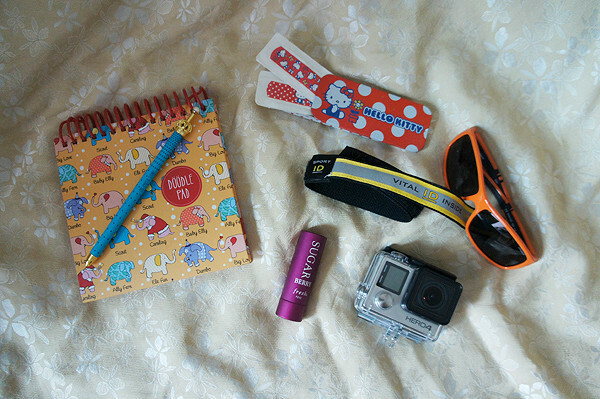 Lyn and her petite travellers (from Lil Blue Bottle) recently went to Phuket and Penang, and here are some things they didn't leave home without! Original Sprout's SPF 27 Face and Body Sunscreen. I love it cos it's the most non-greasy sunscreen I've ever come across, and it's free of Phthalates and Titanium Dioxide too. Good sunscreen is a must because we spend so much time at the swimming pool, on the beach, and just walking outdoors whilst on holiday! Relief balm and lip balm - Blue Stone Botanicals' relief balm soothes everything from insect bites to ouchies and rashes. And lip balm to keep lips supple! Comb, sunglasses, travel pack cotton buds from another hotel stay, and wet wipes (a must-have)! Pencil case of Sharpies - for hours of drawing and colouring fun on the plane and at mealtimes (oops). Passport and foreign currency holder (in owls fabric) - handmade by a Singaporean mum under the PinkLabel brand, it can hold up to 4 passports, and has many compartments for currency so that I can set aside money for airport tax, transport from hotel to airport, so that I remember not to spend everything (it happens). PinkLabel waterproof wet bag (in pink roses with olive leaves fabric) - it is essential for dripping wet swimsuits, goggles and the like! So much prettier than a plastic bag. Karen from Mums Calling is a stay-home mum who loves to travel with her kids. (You can check out her travel posts here.) Read on to find out what she packs into their trunkis. Nivea Sun Kids Sunscreen – A necessity for the kids as they are easily tanned. Some countries can be extremely sunny because of its clear sky throughout the seasons. Caps or hats – While we know they are used to give little faces their much needed shade, we had like to appreciate its dual role of accessorizing the kids. Brightens up holiday pictures too. Moz Away insect repellent – We love exploring nature, and we know what’s living within nature. Whether or not such adventure is in our itinerary, it’s good to have along. California Baby face and body moisturizer – Even in tropical countries. The air conditioner in some hotels can be icy cold even when we turn up the temperature. While in cold countries, their delicate skin can get really dry and chappy. Swim wear – When shopping and sightseeing gets overwhelming, we like to relax and hibernate in the hotel, and make use of its swimming pool. We might bring them to the beach too. Snacks –We can never predict flight cancellations or delays. It’s always good to have some snacks within reach. Small, individually packed and filling for little tummies. Granolas are good buys. Sweets are good bribes. Bedtime buddies – If they didn’t pack this along, none of us would get a good night's sleep. The girl has a doll and the boy a blanket he's had (and cuddled) since infant days. Entertainment – The kids love books. We will seek out thin and light weighted books to pack along. Little notepads, pens, crayons or even a word search book can buy me some peace during their restless moments. Comb – My daughter needs this more than me. Hair accessories – Some choices of hair clips and bands to help my girl look nice and stylish in pictures. We hope you've discovered some new fab finds from this post. Do follow us on Facebook for more updates. And remember to leave us a comment if you have any favourites to add on to these lists! This week, we are pleased to welcome MummyEd who will tell us about her family's trip to Perth, Australia! MummyEd works from home whenever she has the chance to, but with 3 kids of ages 3 5 and 7 years old, those moments are few and far between. She blogs at http://mummyed.wordpress.com and has never been happier to leave the corporate world behind. Over the September holidays, we took our little family, just the 5 of us, on a trip to Perth and to the Margaret River region. 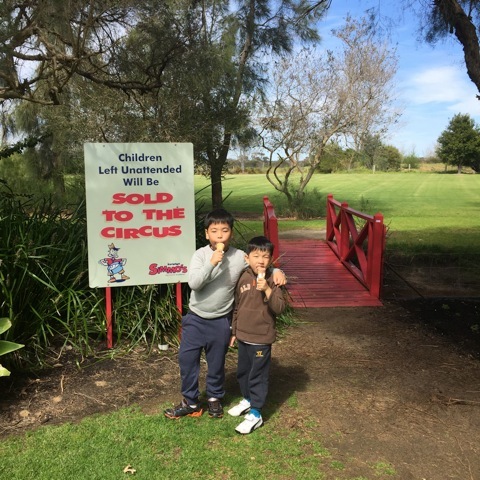 It was the first trip for the kids (who are 3, 5 and 7.5 years old now) to Australia, ever! With lots of fresh air and plenty of space to run around, and an easy-going itinerary, 8 days passed by too quickly! We stayed in mostly apartments, starting with the Citadines St. George's Terrace within the Perth CBD. We arrived on a Friday afternoon, and rooms in the CBD were almost half the price on weekends than they were on weekdays. 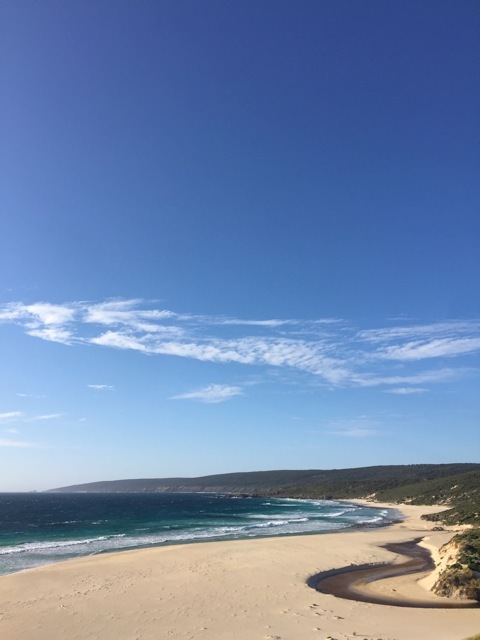 We also figured that the Margaret River area would be less crowded on weekdays, so that was how we planned the itinerary. At the Citadines we stayed in a 1-bedroom apartment, which was large enough for us, had a washing machine, and was walking distance to a large Woolworth's as well as the Hay Street shops. They also have several parking lots within the building, which we made use of since we rented a car. We did have a bit of trouble finding the building and the car park, even though I had already checked out the hotel via Google Map's street view. But eventually we arrived in one piece, and we quite liked the apartment and wouldn't mind staying again. In Perth city, we had a mixture of meals - McDonald's on the first night (well, the kids were hungry and very tired, what better else than to cheer them up? ), Vietnamese, Nando's, or we cooked ourselves. We definitely would have wanted to try more, but we took things easy, and never got around to it! Our next apartment was the Bay Village Resort & Spa Dunsborough. 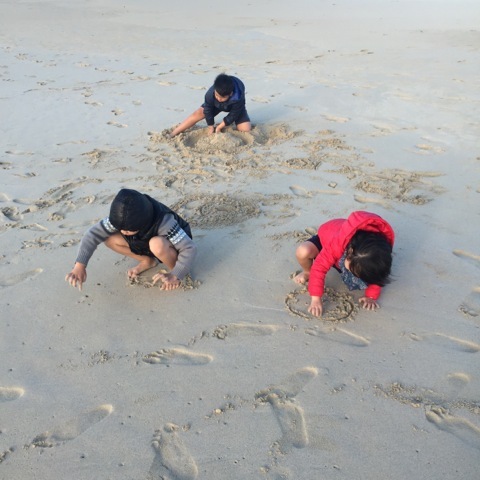 We chose to stay in Dunsborough as there are many child-friendly activities in that area, and Bay Village have loft chalets which has 3 single beds and a queen bed at the loft, which meant that we could all sleep together instead of in 2 separate rooms! The resort is a short walk to the town's amenities like restaurants and a large Cole's, as well as the beach. With the amazing fresh produce that was available in the supermarkets, we made a few of our own dinners, but the first night we arrived in Dunsborough, we ate at Occy's, which I found on TripAdvisor's restaurant listings. It was good! 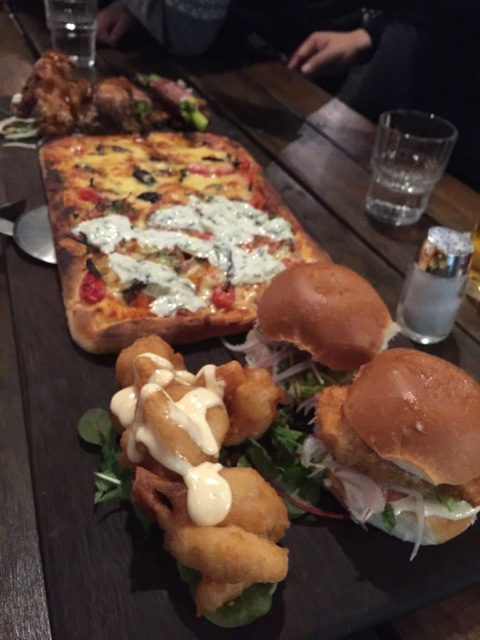 We enjoyed a platter which included two different pizzas and several appetizers. We had originally planned our last night at Mandurah, which is about an hour away from the airport, but we were loving the Margaret River region so much we decided to spend the last night in the Margaret River town itself. However, we woke up late at 9am on the day of our departure, and had to get to the airport, 3 hours away, for a 2pm flight! Thankfully we made it in good time. Next time, we will probably stay closer to the airport! At Margaret River we stayed at the Margaret River Hotel, as they have Family Rooms which have a Queen size bed and an adjoining room with twin beds with one bathroom. It is cozy and quaint, very English, with lots of floral patterns and even floral tea cups, and looks exactly like it does on the website. The location is right smack in the middle of the town, and that evening, with no dinner plans, we took away some calamari and fish and chips from Squid Lips (they also have an outlet at Dunsborough), and found that it was very good. 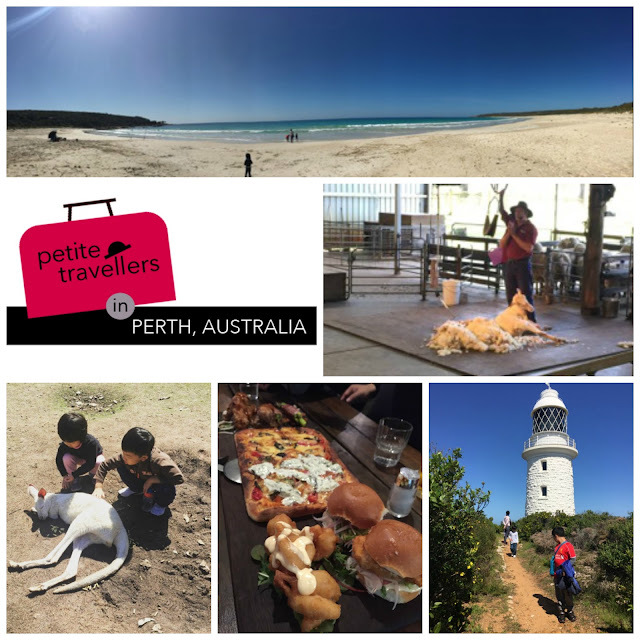 There is really so much to do in Perth and Western Australia. A friend of mine also went for 7 nights, but spent the entire time in Perth city. 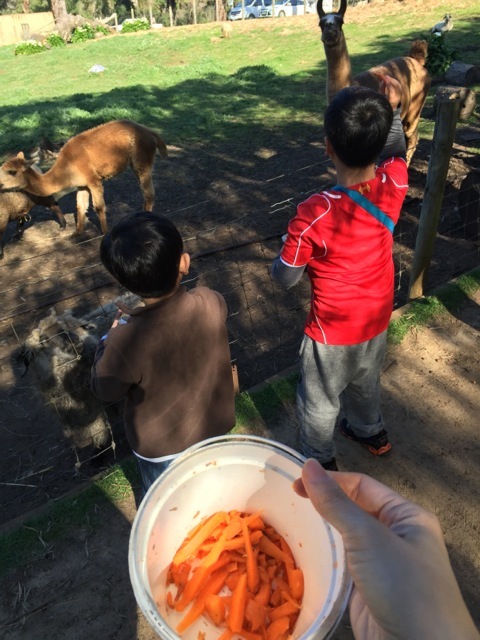 Many of us have the impression that there isn't much to do in Perth, but with kids, and if you enjoy taking it slow and enjoying the time together, there is really plenty to do. There are many playgrounds everywhere! In Perth City, we went to King's Park daily. Yes, every day! It is quite a large park, with ample parking, and 3 (or more?) play areas. We enjoyed their playgrounds, free concerts, and amazing views. If it had not been so windy, we could have spent more time there! 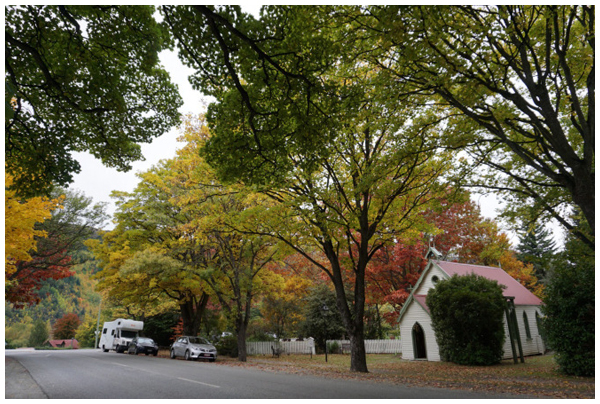 A short drive from the CBD, is Whiteman Park, where there is really so much to do! 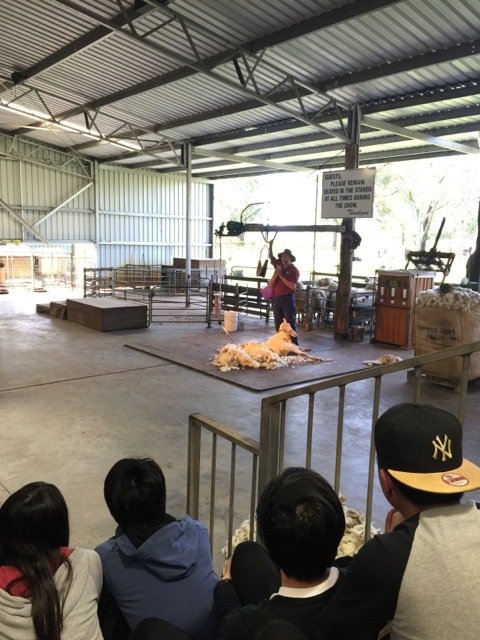 One of the most famous sights of Whiteman Park is the Caversham Wildlife Park. 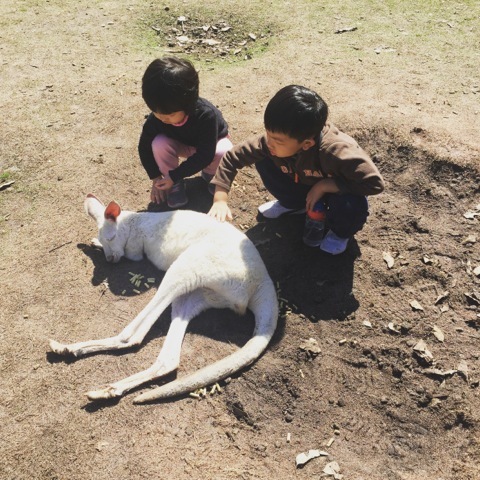 This was the first time the kids had gone to Australia, and they love animals, so they could see a whole variety of the Australian wildlife. 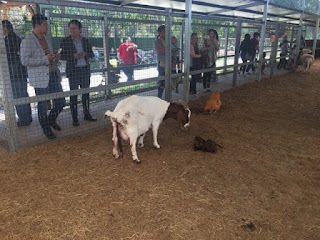 It also includes an area with farm animals, where we saw baby goats around an hour old, and another goat tried to eat the map from the husband's back pocket. The park also includes an interesting farm show which was great for kids, including sheep sheering. We forgot to bring some snacks or a picnic lunch, so we left earlier than we really could have. The park is well kept, and very worth the visit. There were a few other sights that we wanted to visit - SciTech, Freemantle, perhaps some museums, but we never even got around to it! On the day we drove from Perth City to Dunsborough, we first stopped by King's Park again, to let the kids have a little run around before heading south. We bought plenty of supplies from Woolworth's and the husband made breakfast daily, so the night before we prepared some sandwiches. Along the way, we were driving into the little town of Australind, and spied a playground next to the lagoon, where we stopped to have some lunch and play time. Many of the playgrounds have toilets nearby, which always made them great rest stops! Once we were in Dunsborough, we were all ready to explore the surrounding area! We started our first day there with some ice cream at Simmo's, which is quite highly recommended, but it honestly didn't blow me away. There is a very lovely playground on the grounds, and they have 2 emus and a camel which you can see up close, which are worth a visit if it's along the way. 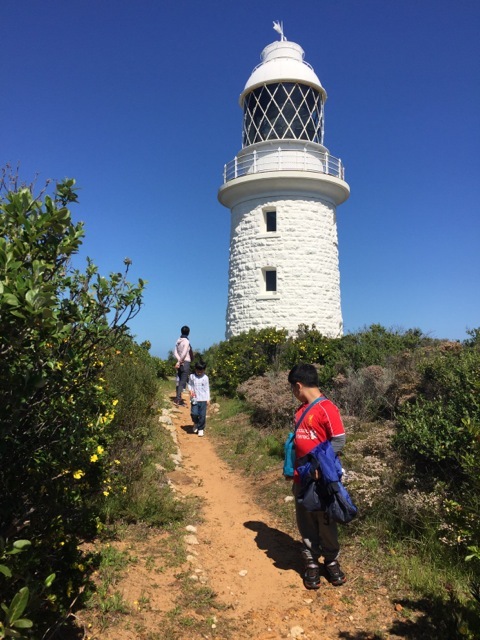 My kids love watching Paw Patrol, and I know lighthouses are hard to come by, so I insisted we go to Cape Naturaliste, since Cape Leeuwin was too far away and we were not intending to go there. Cape Naturaliste is apparently one of the smallest lighthouses, but this makes it easy for the kids! We paid for a guided tour, and my 3 year old daughter made her way up and down the lighthouse easily. We learnt much about their way of life, and ship navigation. Best of all, while we were admiring the views from the top of the lighthouse, we got to see some Southern Right Whales! 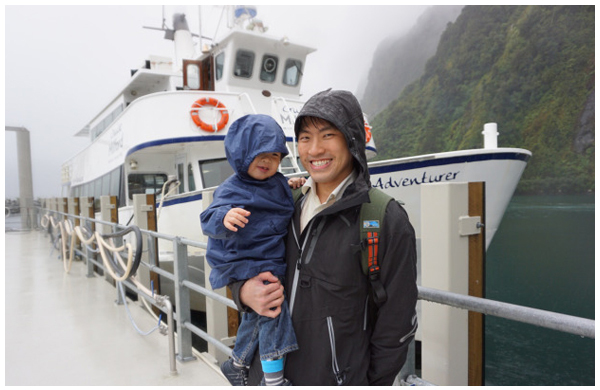 We had decided against going on a whale watching cruise because it was quite cold, and the husband was worried about the safety for the kids, so being able to catch them was just amazing. After the lighthouse, we headed down to Bunker Beach Cafe, where we were able to catch more whales in action! Lunch was really good, and after lunch we headed to the beach where the kids spent quite a lot of time playing. We probably would have been there the whole afternoon had it not been too windy. 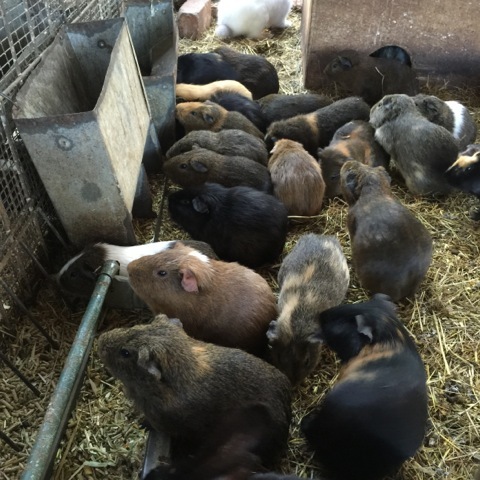 We decided to head to Country Life Farm, and we spent a few hours feeding the rabbits, guinea pigs, goats, lamas, sheep, ducks, cows, etc. I find the farm rather old, but the kids loved it anyway. 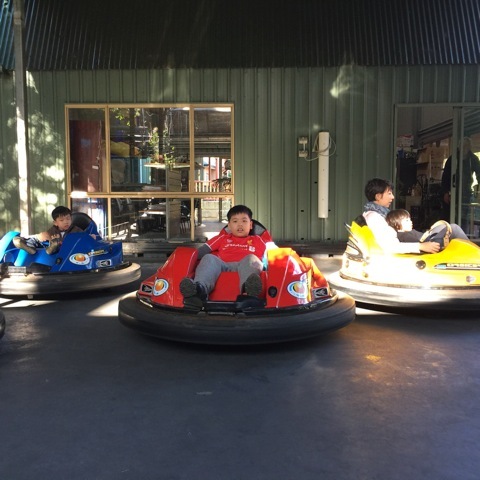 There are also bouncy castles and bumper cars and a little lake you can row along, and a small carousel, as well as 2 play rooms, all included in the entrance fee. We have visited a fair share of wineries over the years, including some in the Margaret River region, so vineyards and winemakers weren't on the top of our list this time. Perhaps if it had been harvest season I would have been keen to bring the kids for a vineyard tour (if there are any catered to kids?). But the vines were only starting to grow for the season, so there weren't any grapes to even look at. The husband and I have also been to Busselton, so we decided to explore places that we had not been to before. On the day we wanted to visit the Margaret River Silk Road to see some silk worms, it was closed. So we headed slightly down the road to the Amaze'n Margaret River. 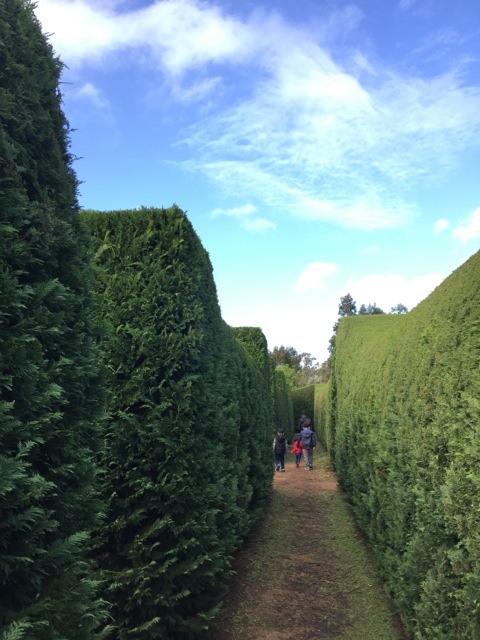 The maze was really something! We had good fun trying to find our way out, and then spent some time walking along the gardens. It was very windy and cold that day, otherwise we could have spent more time there. They also have a nice little cafe and many games for the cafe area. This travel post is written by Cayce who blogs at All Days Beautiful. 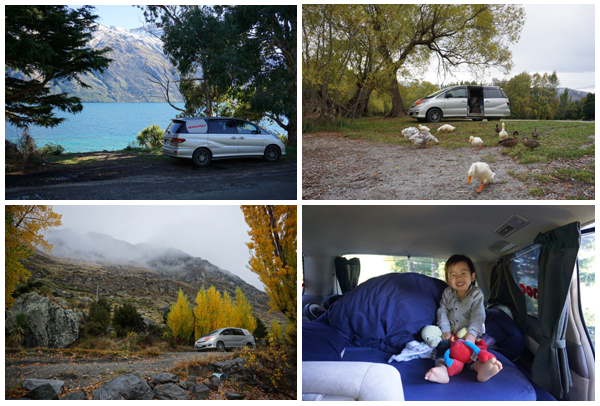 She travelled to New Zealand on a 13D12N self-drive road trip with her petite traveller Lewis (2 years) in April 2015, exploring the pristine untouched beauty of the South Island. This holiday is suitable for families who enjoy self-drive holidays, with a love for the great outdoors and seeking out extraordinary scenery. 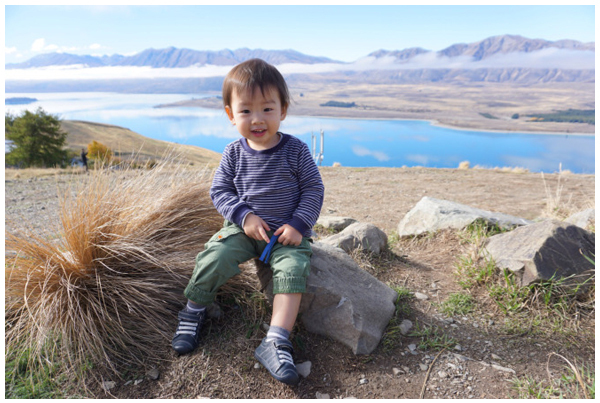 First up, I want to thank Candice for linking up my posts on our recent New Zealand family trip, and for this exciting guest posting opportunity! 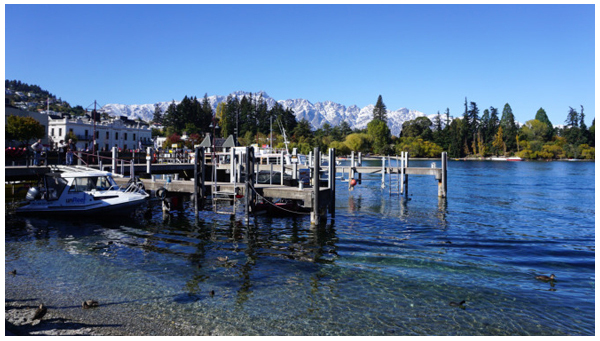 We (just my husband and I then) first visited and fell in love with New Zealand’s South Island in spring 2011. Without a doubt, we knew we would be back again someday! This time round, we chose to travel during the fall season. It is the season we have yet to experience anywhere, and the other plus point? Right, the lower accommodation rates and tourist numbers since fall is shoulder season on the island. 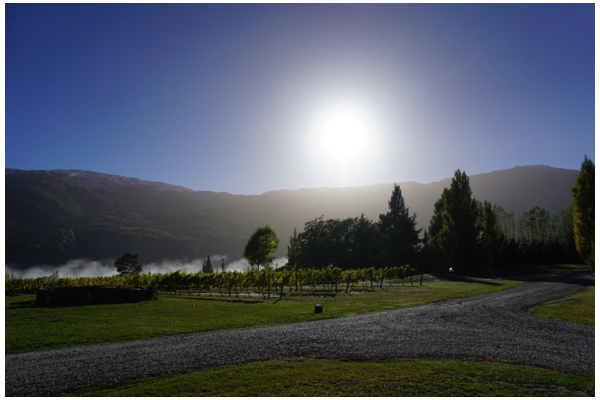 With its laid-back vibe and lovely weather all year round, it’s easy to love the South Island. I dare say there is something for almost everyone – if you appreciate good food and wine, New Zealand is well-known for its perfect wine climate and fresh produce; if you love the great outdoors and stunning landscapes, there is an extensive list of hikes (easy or challenging, it’s really up to you) boasting panoramic views; and if a peaceful and calming getaway is what you are seeking, you will easily find that haven anywhere. In this post, I’m going to share on some of our adventures in the real down-under – how we incorporated fun (we tried!) for our own petite traveller while we parents ticked off our must-do lists. 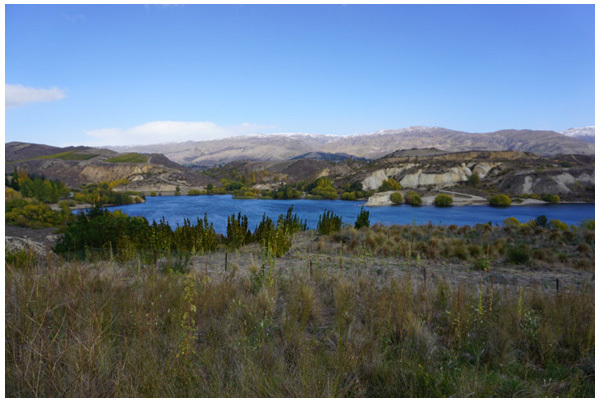 Central Otago is worth a day (or maybe two; it is the wine country after all!) of your time. Following the recommendations from our accommodation hosts, we focused on a couple of wineries in the Bannockburn region. Carrick Winery is one we highly recommend! The husband did a solo-session of wine tasting in peace (I guess he must have liked the Pinots and Rieslings since he bagged a few bottles of those), while the large grounds of Carrick kept L and me busy. For him, a toy-box and running loose picking up twigs and lavender sprigs; for me, mostly marveling at the views while chasing after L. We spent a good few hours there on that gorgeously clear day. We booked a vineyard stay at nearby Kinross Cottages as well, just to complete the whole experience! 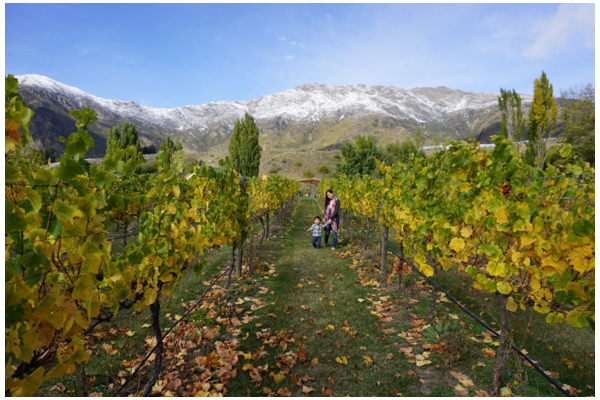 It was surreal for us, waking up to a vineyard; those greens and golden yellows against a snow-dusted mountain backdrop was an unforgettable sight. For L too, it was a whole new experience he really enjoyed – being able to pluck apples off trees and grapes off vines right at our doorstep, and eat them! The South Island is filled with panoramic vistas at every turn, but here are some we personally feel were the best from our trip. 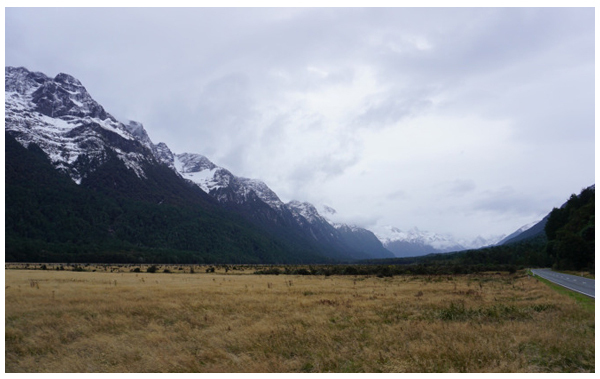 The only way in to Milford Sound is from Te Anau. The journey from the small town to the sound itself is a big part of the experience, so look out for the many scenic lookout points along the way. One of our highlights of the drive was passing the Homer Tunnel – a 1.2km stretch into Milford built by cutting through mountains! We drove through the granite tunnel in pitch-black darkness for a few minutes (guided only by our car headlights); rather exciting but scary at the same time. Coaches from Queenstown/Te Anau are scheduled to arrive in Milford Sound around 12pm, so an early start from Te Anau is key to getting ahead of the traffic on the road and crowded ferries. Catch the earlier ferries before 12pm; they tend to be much less crowded and it’s easier to move around during the cruise. There are no petrol kiosks along the way, so make sure you have a full tank of fuel that will last the drive both ways. There is also no mobile coverage once you leave Te Anau. 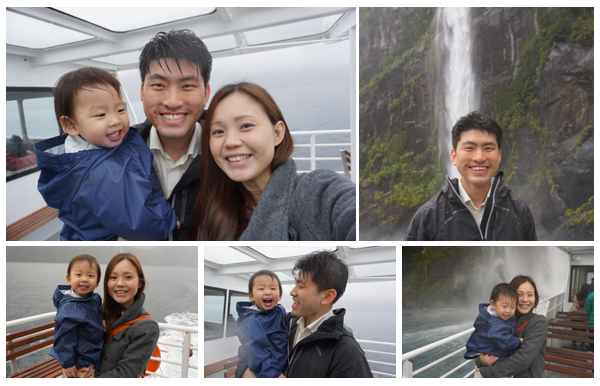 It was L’s first encounter with a ferry or a cruise. To be honest, our cruise turned out to be a very different experience from what we had expected. Due to the gloomy weather all day, visibility was significantly compromised and we did not get to catch the Sound in all its glory. 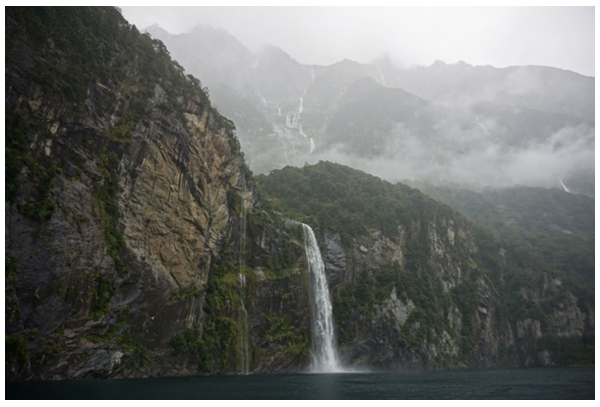 Apparently, this is very common in Milford Sound so come prepared with windbreakers and hoodies! The heavy rain meant that waterfalls were aplenty though. Our captain from Cruise Milford brought the vessel underneath a few plunging waterfalls, which delighted L despite him getting drenched. This kid really takes to the cold! The cruise only lasted 1.5hrs, but for the rest of the trip L constantly brought up his ‘sit the boat’ adventure. He definitely loved this experience, quite possibly his favorite of all. A visit to this little town is a must in fall, as it is the only part of the island that lights up with abundant autumn colors during the season. We started the day with a 30 minutes return riverbank walk, perfect for us to admire the hillside foliage as it wasn’t too long a distance to carry L who got tired at the end of it. 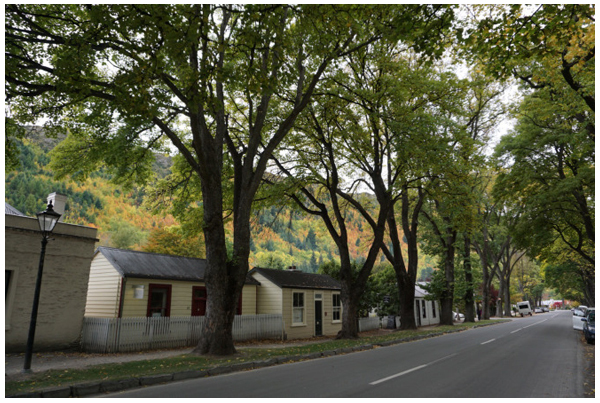 We also checked out some of the town’s most photographed streets; really, Arrowtown does live up to its name of having the most gorgeous fall colors! It was the first time L had seen leaves in so many different shades, which he happily named. He must have really liked them, as it was also a first for me to see him willingly touch the damp ground and leaves, instead of his usual distress about even a single bit of dirt on his hands. 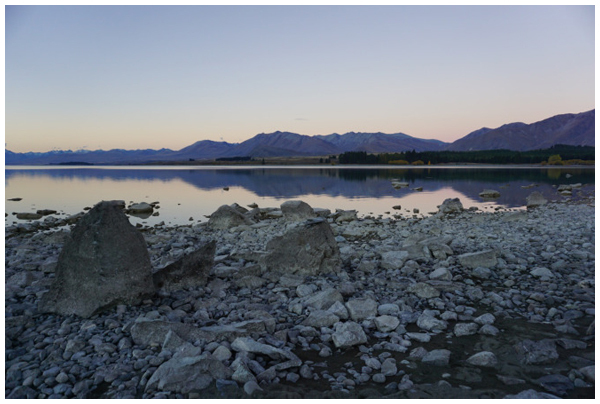 If you have time to spare, the nearby Lake Hayes is worth a pop-by. We were there till the late afternoon, in perfect timing to catch the lake bathed in golden light. There wasn't anything much to do there.. but we had some great fun climbing trees and being silly. Oh, and feeding ducks - L's favorite activity! The absolute highlight of the day for L though, was The Remarkables sweets shop. He only had eyes for it after we strolled past it. We tried to distract him, but eventually rewarded him with some candy after his persistence in directing us back to the shop. If you have a sweets-lover like we do, this is one shop you have to check out – it’s filled with all sorts of goodies, so you’ll have a hard time choosing! If you are traveling with older kids who can sit through a movie, there is also a quaint Dorothy Browns cinema in town for a lazy afternoon. Just don’t expect to catch the latest blockbusters though! 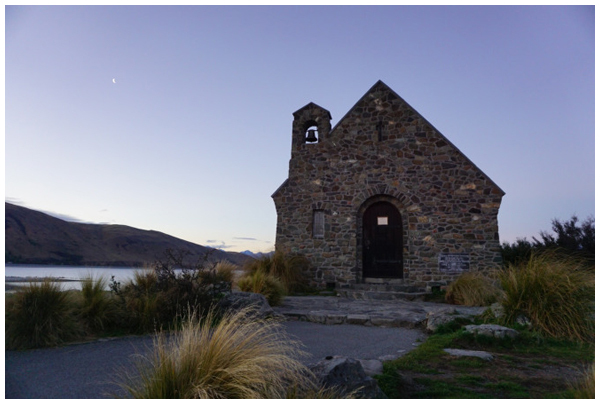 Even if you have not yet been to New Zealand, you must have heard of Lake Tekapo. It is breathtakingly beautiful, no wonder a top favorite among visitors. 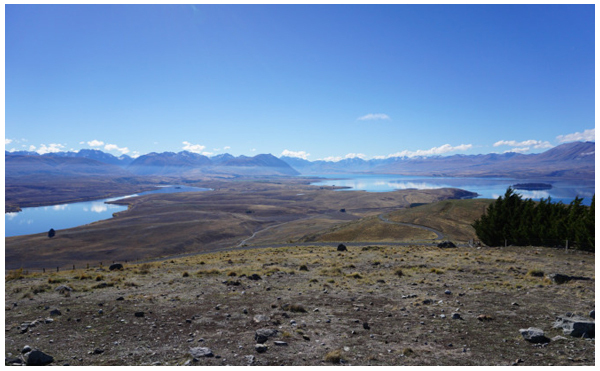 We drove up to the Mount John Observatory for a top-down view of the lake and surrounds; up here, the views were truly a 360-degree panoramic vista. There are some easy trails around, so if you and your little traveller are up for some hikes they are easily accessible. Or if you prefer to sit back and take in the views like we did, the Astro Café (Lonely Planet once called this ‘possibly the best place on the planet for a coffee’) serves some decent cakes and drinks. A toy-box is also available, which kept L occupied when he was done exploring the observatory. In the evening, we took a stroll along the lakeside. The husband and L busied themselves with their exploration of the shore (climbing over rocks and picking up stones), while I watched the pretty dusk colors. 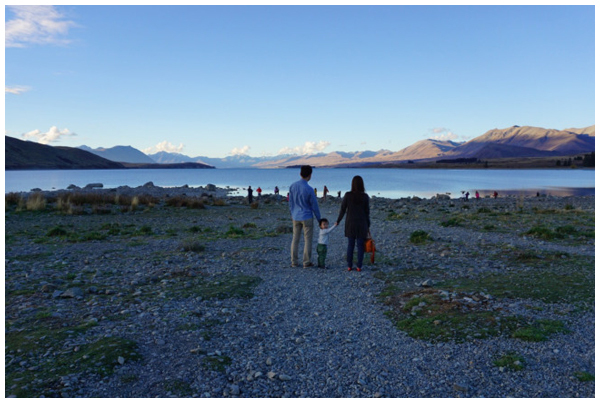 Catch a sunset here, and it would be impossible to not fall in love with Lake Tekapo – it was that beautiful. At night, we watched the most brilliant display of stars above our heads. The area is part of the UNESCO Dark Sky Reserve, and it's not known as ‘the greatest park in the sky’ without reason. 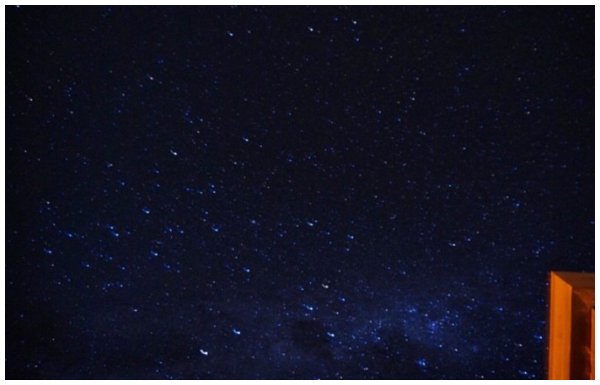 So amazed was L by the night skies in New Zealand, he was requesting to ‘see stars’ throughout and after our trip. A stay overnight in Lake Tekapo is definitely recommended for this once-in-a-lifetime experience. If you are an adrenaline junkie, Queenstown is the place for you. Choose from an extensive list of activities – skydiving, bungee jumping, the Shotover Jet; it is the adventure capital after all. 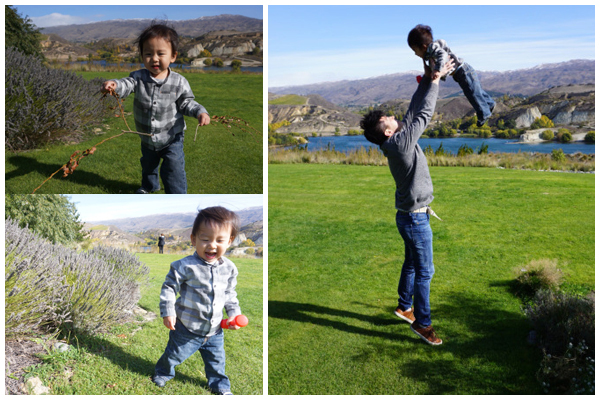 While you're at it, there are a number of kid-friendly options in Queenstown to keep the little ones occupied. 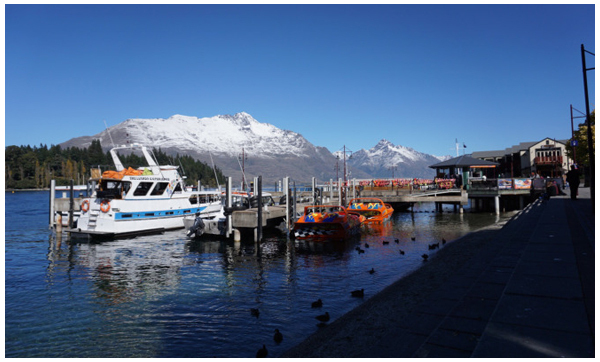 Take a river cruise down Lake Wakatipu, or if you prefer to stay on land, visit the underwater observatory to catch a glimpse of diving ducks and marine life under the lake. 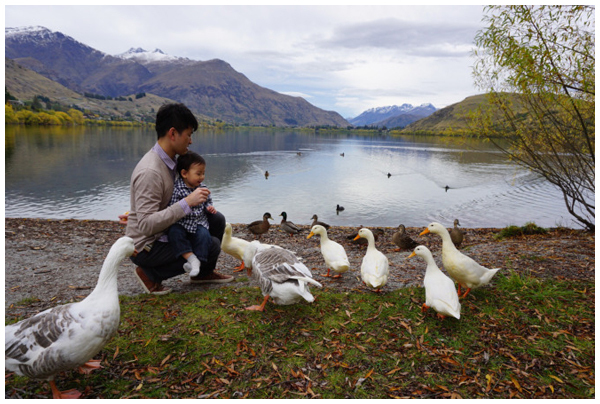 For us, we made time to feed ducks at the waterfront, simply cos L loved it. We also went on the Skyline Gondola, which was another hit with L! 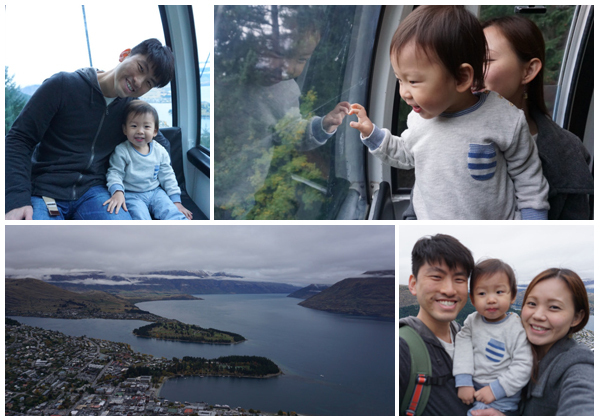 His first time on a cable car, L was very much intrigued by how high we were climbing. At the top, the view of Queenstown and beyond was spectacular (on a clear day, it would be even better!). L definitely enjoyed the cable car rides up and down more than the actual view. Self-driving on the island is generally easy, as there is little traffic on most roads. The roads are very well-marked too, so even without a GPS we had little difficulty getting to most places. Of course, on some of the alpine highways, extra caution is advised as the winds can get quite strong. Instead of our usual trusted Hertz, we opted to rent a mini campervan from Spaceships for our road trip. Our rental came with a whole lot of amenities like a DVD player, a mini fridge, and some portable cooking stuff (which we didn’t use), but what attracted us was the bed which could be expanded into a queen-size! 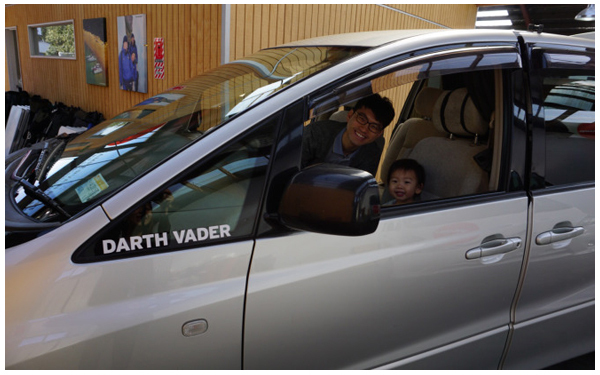 This proved to be a real lifesaver for some of our long drives – we would pull up somewhere scenic, L would take a proper nap on the bed (instead of the car seat) while we had a snack and some time to ourselves; almost always guarantees a fully rested and happy L! Oh, and remember to pack along a variety of toys for the road. The drives can be a few hours long between some places, so these will help keep the kids entertained. They will come in handy for the long flights there and back home too! Generally, we found New Zealand to be very kid-friendly. The locals are really sweet with the little ones and hardly bat an eye when they act up, and cafes and restaurants (or at least those we visited) usually have toy-boxes which help keep them occupied through mealtimes. Definitely a lot less stressful for the parents! Unlike Australia though, there are not many playgrounds, zoos, or farms for kids around; it's understandable why it isn’t as popular a family holiday destination as its neighbour. A tip for planning your holiday here – the trip is really all about the great outdoors with its picturesque landscapes. To make that fun for our little L, we took note to include him as much as we could in enjoying what the island had to offer together. We took the easy walks, stopped at all (almost!) the lakes we came across, set up new experiences, and allocated excess time in our itinerary for him to really explore and play. It definitely meant that we weren't able to cover as much ground or places, but our reward for going slow? - it is the most heartwarming thing to see our little guy immersing in each new place and experience, and loving it! There is a lot more that the South Island offers, and you should need at least 3 weeks to cover all of that at a comfortable pace. Visit Oamaru and the Otago Peninsula along the coast for close-up encounters with penguins, seals and albatrosses, or Kaikoura at the tip of the island for some whale watching. Take a hike on one of the glaciers on the West Coast if you have an older kid, or if trains are to your little travellers' fancy, catch the Tranz-Alpine on a world famous journey from Greymouth to Christchurch through spectacular mountain passes. We have experienced some of these before L came along, and I know he'll love these adventures when we next visit! 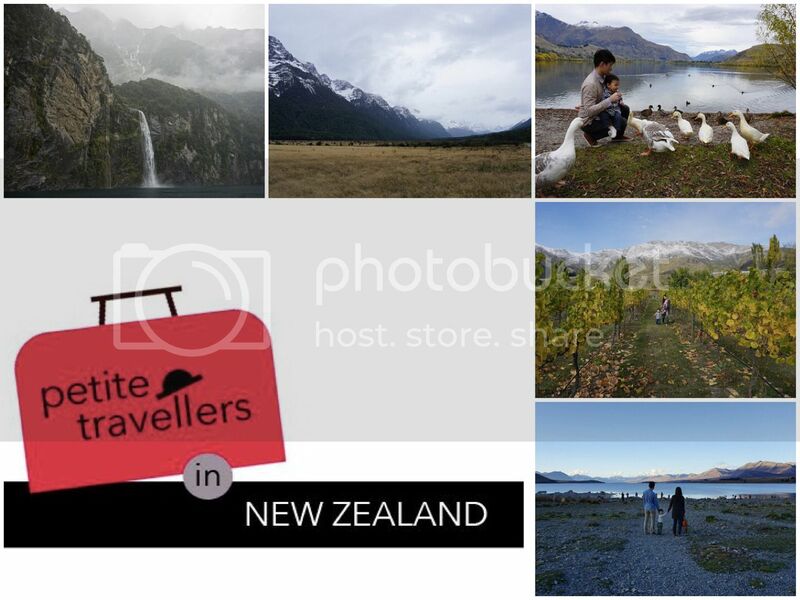 In short, we love New Zealand! If you're headed there sometime, I hope this post helps you with some of your planning! Petite Travellers is a collaborative blog about family-friendly holidays for discerning little people. Meet the Team here.